When he took office as Egypt’s new president in June, Mohammed Morsi pledged to follow a pluralist policy that respected the rights of women and non-Muslim minorities. But everything he has done since then indicates that he intends to replace the secularist dictatorship of his predecessor with an Islamist one. Egypt’s president sat cross-legged on a green rug with his eyes closed and hands raised in prayer. His lips moved as Futouh Abd al-Nabi Mansour, an influential Egyptian cleric, intoned: “Oh Allah, absolve us of our sins, strengthen us and grant us victory over the infidels. Oh Allah, destroy the Jews and their supporters. Oh Allah, disperse them, rend them asunder.” This was a Friday prayer service held in the western Egyptian port city of Marsa Matrouh on October 19. The words of this closing prayer, taken from a collection of sayings attributed to the Prophet Muhammad, seemed quite familiar to Mohammed Morsi, Egypt’s new president. A video clip obtained by the US-based Middle East Media Research Institute (MEMRI) shows Morsi murmuring the word “amen” as this pious request for the dispersal of the Jews is uttered. The Muslim Brotherhood, which backs Morsi, has since removed a note concerning the president’s visit to Marsa Matrouh from its website, and the daily newspaper al-Ahram has reported that the president must have been “very embarrassed” over the matter. Are such statements enough to dispel the incident? Morsi has been in power for four months. In June, with the backing of the Muslim Brotherhood, Morsi won a narrow victory over a representative of the country’s former regime. Many voters supported Morsi only out of fear of a return to the days of dictatorship. But the new president has remained an enigma to his people. Who is this man with an American Ph.D. in engineering, who sometimes presents himself as a democrat and a peacemaker and sometimes as a hard-line Islamist? Egypt’s critical newspapers call this trend “ikhwanization,” with “ikhwan” meaning “brothers.” The process has seen the president and the Muslim Brotherhood bringing all state-run institutions under their control within a short period of time. This includes state-owned media, where critical editors-in-chief have been replaced with Morsi supporters. The “Holy Koran,” a state-run radio service that has traditionally been moderate in terms of religion, has also become “ikhwanized.” It has declared that so-called liberals are nothing more than immoral heretics who have “fallen” from Islam and are bent on the single goal of destroying society, and it has asserted that only the president can lead the country to “true Islam.” In some parts of the country, Egyptians seem to be trying to outdo one another in their displays of piety. A teacher in the Luxor governorate, in southern Egypt, recently cut off the hair of two 12-year-old students after the girls refused to wear headscarves. The incidents sparked protests, and the teacher was transferred to another school. When a Coptic Christian tried to order a beer in a suburb of Cairo last week, the waiter reacted violently. The government plans to massively restrict the consumption of alcohol, a move whose effects will also be felt by members of the country’s Christian minority. Especially in Upper Egypt and in Alexandria, where religious tensions already existed under Hosni Mubarak, thousands of Christians are believed to have applied for visas for the United States and European countries. What has become of Morsi’s promise to be an impartial president? “The boundaries between the office of the president and the leadership of the Muslim Brotherhood aren’t defined,” says Hamzawy, the political scientist, in an understated way. Many Egyptians believe Morsi is still taking his cues from two men in particular. 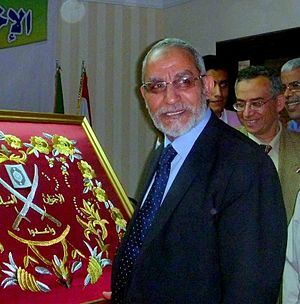 One is Mohammed Badie, a 69-year-old professor of veterinary science and the man to whom all members of the movement swear lifelong loyalty as the Brotherhood’s “supreme guide.” The other, Khairat el-Shater, was initially the Muslim Brotherhood’s presidential candidate, but he was disqualified before the election on account of having once been imprisoned for money-laundering — although this was admittedly under Mubarak, who used his justice system to sideline political opponents. Shater, a millionaire with good connections to the Gulf states, is considered an important financial backer of the Muslim Brotherhood and is believed to have been Morsi’s direct superior within the organization. Shater has considerably expanded his empire of supermarket chains and textile and furnishings shops in the new Egypt. Likewise, he’s viewed as a model businessman among the Muslim Brotherhood, which has so far continued Mubarak’s neoliberal economic policies. It’s an approach meant to win the trust of the foreign investors that Egypt so desperately needs. Mubarak left his successor a country deeply in debt, where millions of people are unemployed and a quarter of the population lives below the poverty line. For years, salaries were constantly kept low and unions were suppressed. Keeping Egypt from national bankruptcy will eventually require unpopular decisions, such as cuts to gas and bread subsidies. But, so far, Morsi has decided to wait it out. The only area where he has been active is a different one entirely: In a television address last week, Morsi announced a new religious campaign that will see an army of preachers fan out through the country “spreading the true word among the people.” It’s a re-education measure that may yet help to dislodge Western ideas from people’s heads — such as the absurd belief that religion is a private matter. This entry was posted in Uncategorized and tagged Egypt, Hosni Mubarak, Middle East Media Research Institute, Mohammed Badie, Morsi, Muslim Brotherhood, Tahrir Square, United States. Bookmark the permalink.